Review by AllTheBestFights.com: 2016-09-17, pretty good fight between Firat Arslan and Nuri Seferi: it gets three stars. The former Wba champion Firat Arslan entered this fight with a pro record of 37-8-2 (23 knockouts) and he is ranked as the No.28 cruiserweight in the world. He suffered his last loss when he faced Yoan Pablo Hernandez in 2014 (=Hernandez vs Arslan), since then he has won three bouts beating Claudio Morroni Porto in 2016. His opponent, Nuri Seferi, has a boxing record of 37-7-0 (21 knockouts) and he entered as the No.87 in the same weight class. He lost to #1 Krzysztof Glowacki last year (=Glowacki vs Seferi) but he came back to win in 2016 defeating Dusan Krstin. 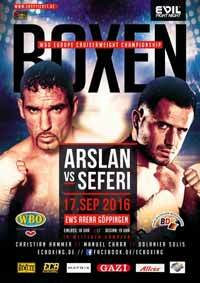 Arslan vs Seferi is valid for the vacant WBO European cruiserweight title. Watch the video and rate this fight!